Had enough of the day to day grind? Welcome to the alternative world of jingle, ballad, and dirge. 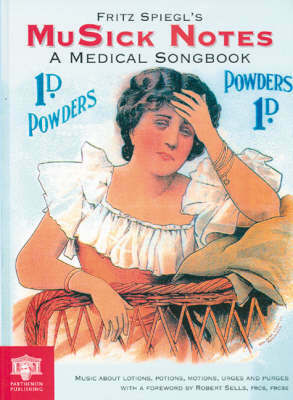 MuSick Notes: A Medical Songbook gives you a glimpse into the past with this collection of songs commonly sung in Victorian and Edwardian parlors. Providing a unique social history of medicine, these songs chide and tease doctors for their pomposity and the mysteries of their practice. In addition, the book includes some of the first advertising jingles touting the latest cure-alls. In this 'pre-modern' era, the fledgling principles of systematic medicine were largely unheard, untried, and most certainly untrusted. Those that did surface in the popular press seemed too strange to be real, and became irresistible targets for joyful scorn. From the miracle cure touted in the musical advertisement 'Ju-Jah', to the dangers of dieting discussed in 'The Thinnest Girl I Know', every song explores an aspect of contemporary attitudes on medicine and health. With his trademark well-res earched commentary, both informative and amusing, Fritz Spiegl presents a unique posy of riotous, corny, tongue-twisting, and ingenious songs that give us insight into the role of medicine and quackery in the lives of our Victorian and Edwardian forebears. A fascinating compendium of musical numbers, MuSick Notes: A Medical Songbook demonstrates how the public can get its own back on the doctors.